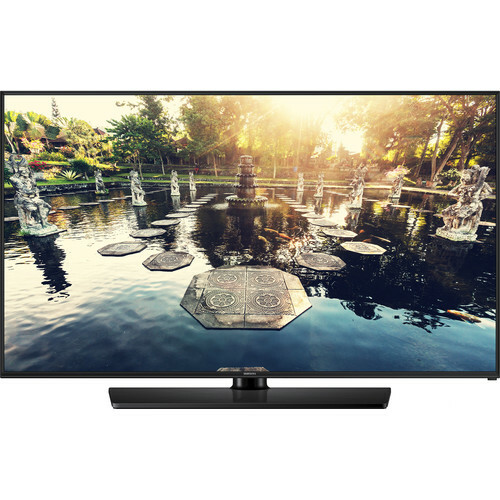 The black Samsung HG50NE690BF 50" Full HD Slim Direct-Lit LED Hospitality Smart TV allows you to watch movies and TV shows from streaming services, instantly check Facebook, Twitter, and Skype, and even push content from your personal devices to the big screen. The Smart TV offers a maximum resolution of 1920 x 1080 and a viewing angle of 178/178° (H/V). Built on the HTML5 standard with Flash support, the H-Browser is a smart TV solution that features both free and VOD (video on demand) content. It can interface directly with the head end without the use of a set top box. The Samsung Smart View feature lets you seamlessly share content across your DLNA-connected Samsung devices, which includes WiDi, without the need for a network cable or a connecting device. It also allows screen mirroring and video streaming to enable seamless content sharing. The Samsung’s LYNK REACH 4.0 fuses the benefits of its SINC and REACH hospitality technologies to offer a comprehensive content management solution. As a unified content management solution, the LYNK REACH 4.0 accommodates LAN, Wi-Fi, and coaxial infrastructures to amplify hotel management, monitoring, and guest service functions. Transferred by proprietary management server (PMS) and customized templates, hospitality users can create and deliver personalized service for a more memorable experience. This includes access to a range of IP channels and RF channels, applications and services mirroring what guests expect at home and on their mobile devices. The LYNK REACH 4.0 additionally enables two-way communication between hotel management and guests. The solution’s remote control capability for in-room display ensures quality service delivery in real time without in-room labor and maintenance.